31/7-11 was the day when we finally reached Kyoto, the original reason for coming to Japan this year, though the MPMI conference was cancelled following the Tohoku earthquake of 11/3. We started the day in Osaka with an excellent breakfast at Hostel 64 (postcard below the aquarium). 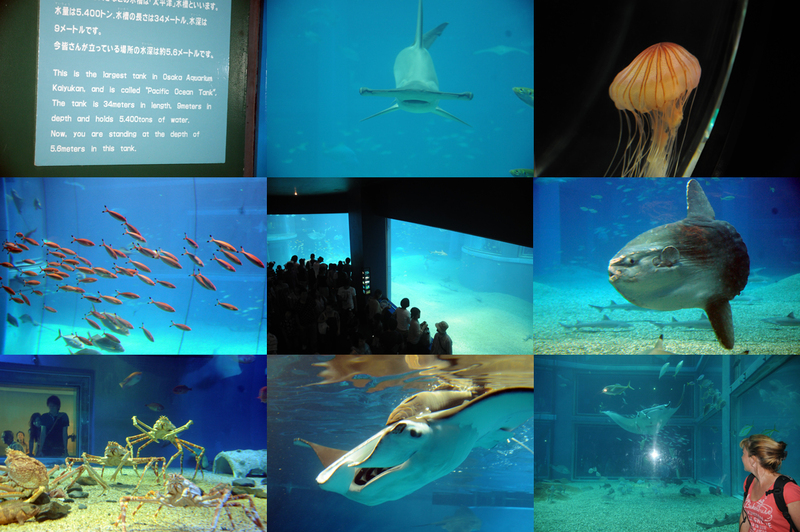 We had read that the Aquarium Kaiyukan should be top of the agenda. We agree. It is more than amazing. Gobsmacking! Go for it. Worth a weekend trip to Japan for :-) OK, maybe not diving off the Galapagos. but a fine experience. The aquarium was about 20 minutes from the hostel by metro. Very popular on the Sunday morning as you can guess from some of the pictures. We saw 3 other non-Asians. Lunch was a burger at the local mall and food market, then back to the hostel to pick up the bags. We decided to try one of the other rail companies which runs one of the three railway lines connecting Osaka to Kyoto. Takes 40 minutes in stead of the Shinkansen's 15. But we were in no particular hurry. Emerged from the station to a cloudburst - only the second rain in our two weeks here. Bus #5 to RokuRoku, our home for 6 nights. In the evening, we a small local grill restaurant where the menu included bear, wild boar, goose and grasshoppers! We skipped the bear :-) Delicious! For the adventurous, fried grasshoppers are quite crunchy.